After Christmas, when the calendar was spent, I’d even tuck it away in my bedroom until the next year. Then, I’d have my very own upstairs calendar to open all over again the next year, day by December day. Naturally, Advent calendars were a tradition I was eager to pass on. We too started with the old-fashioned paper calendar. Then Grandma and Papa gave our children this beautiful woodland Advent cabin with an animal to find each day. Sure enough, my children love opening both kinds of miniature doors as we await Christmas. When I first heard about homemade Advent calendars a few years ago, I was agog. I mean, look at the gorgeous creations on Pinterest. Alas, I’m just not terribly crafty, nor am I a fan of daily treats or trinkets for my kids all December. But this simple, low-key option, with kindness activities built in, called to me and I decided to give it a whirl. I dutifully crafted a calendar which incorporated Christmas-y home activities, outings, and ideas for thoughtful gestures. It seemed the perfect way to celebrate the season in a nonmaterial, family-oriented way. A funny thing happened, though. The children expected daily surprises – and there were a few big outings tucked in there, but they were keyed up upon opening the calendar every day. Until, at least, they discovered it was mostly prosaic stuff. Opening “read a Christmas story” is boring when it’s something we’re already doing – and had been enjoying until someone trumped it up into the Activity Of The Day. “Visit the botanical garden” Christmas display was a letdown when they flipped the calendar already knowing it was the day to go. And “call a grandparent” became a commandment instead of a fun, spontaneous idea for a quiet afternoon. The holidays for us are jam-packed already, and my rather sensitive kids amped up enough, without my carefully planned calendar adding sugary rushes of excitement and letdowns. It was completely my idea to start the tradition, based on nothing but my own nostalgia, and it simply wasn’t a good fit for our family. So I let it go, and perhaps not surprisingly, no one has asked for it. We’re continuing on with our paper and wooden calendars. 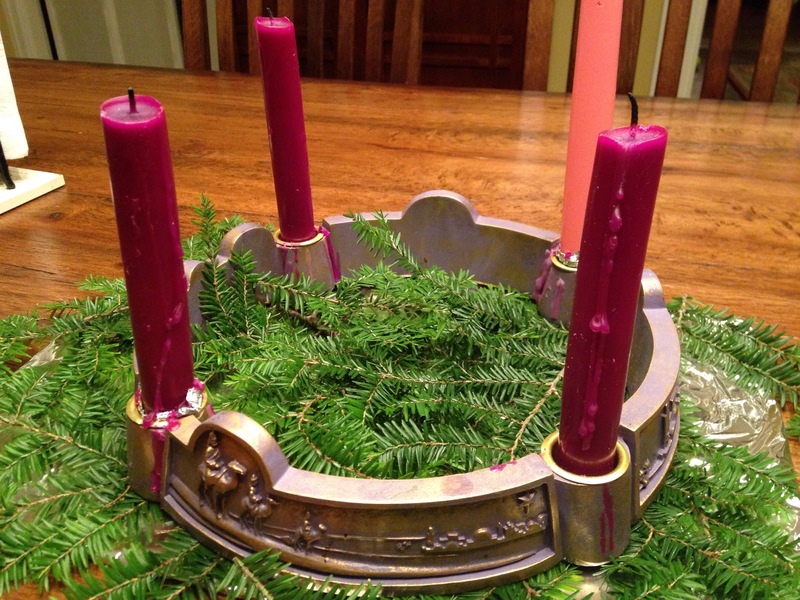 And as in years past, we light the Advent wreath and do a reading each night. That’s all the scheduling we need for now. If we want to watch a Christmas movie, or build a snowman, or bring treats to a lonely neighbor, we’ll do that. But we’ll follow the beat of our days, and we’ll make our lovely memories of the season at our own speed. This entry was posted in Thoughts and tagged Christmas, Holidays, Simplify. Bookmark the permalink. Wow, they just keep on coming! How prolific. I think you’ve found your niche.